The latest 2-screen in-Car DVD player from Nextbase, the Click & Go 9 lite Duo is an upgrade from standard players, in terms of convenience, safety, and overall value. It features a twin display so two people can share the same movie, or even watch two movies across screens. The free stanchion mount that comes with the Click & Go Lite makes sure the device is intact in the roughest of terrains. 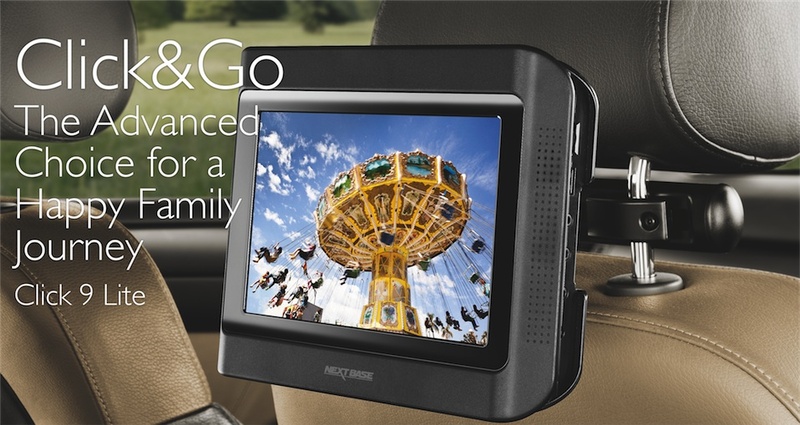 The Click & Go system from Nextbase is the only in-Car DVD player with a crash test approval. All previous models till this point came with the basic headrest mounts, which were the first thing to come off and cause injury during a crash. But this marvel from Nextbase has especially taken care of safety aspects. From the built-in metal plates to a specialized locking system, the Click & Go series has double checked its safety features and has therefore PASSED European crash test standards. Forget the long cable work or confusing buttons as many other portable DVD players, which are mounted on the car headrest with power cables plugged at one side. This made the whole thing take longer, cluttered and even dangerous for small children. But the Click & Go 9 Lite simply slides into the mount and you can click it in place. It even resumes the video where you left off. The cigarette lighter power cable goes into the stanchion mount and is left in place, so you can just Click & Go with your entertainment. This is way more neat & user-friendly than other models. As an upgrade from the older LCD technology, the Click & Go lite uses LED (Light Emitting Diodes) backlighting, so the contrast & sharpness of the video is top notch. This also ensures it has higher brightness capabilities as well as a clearer, high-resolution image. So even a bright sunny day would not hinder your viewing, and at far lesser power consumption. The Click & Go lite uses built-in Infra Red transmitters to quietly enjoy movies via wireless headphones. You can even listen to the Radio in the front at the same time. The player is multi-region & supports all popular Audio-video-Image formats. So you can enjoy DVDs, DVD±R/RW, CD, CD-R/RW bought in any country, supporting Video: MPEG-1 & 2 for DVDs, Audio CDs & MP3s, and JPEG photos. Featuring an inbuilt anti-skip technology, the listening & viewing quality will be smooth even during a rough ride. It has USB ports on its side to enjoy all the above media from a memory stick as well. The wide, 9” screen provides adequate viewing angles for more than one person, at home or in the car. You can also use this device on a flight or a train journey and it will provide up to 2.5 hours of playback through an optional, compact Li-Polymer battery. As mentioned in the beginning, the Nextbase Click & Go 9 Lite Duo Twin Screen Portable DVD player has a long list of features for safety, quality, and convenience. 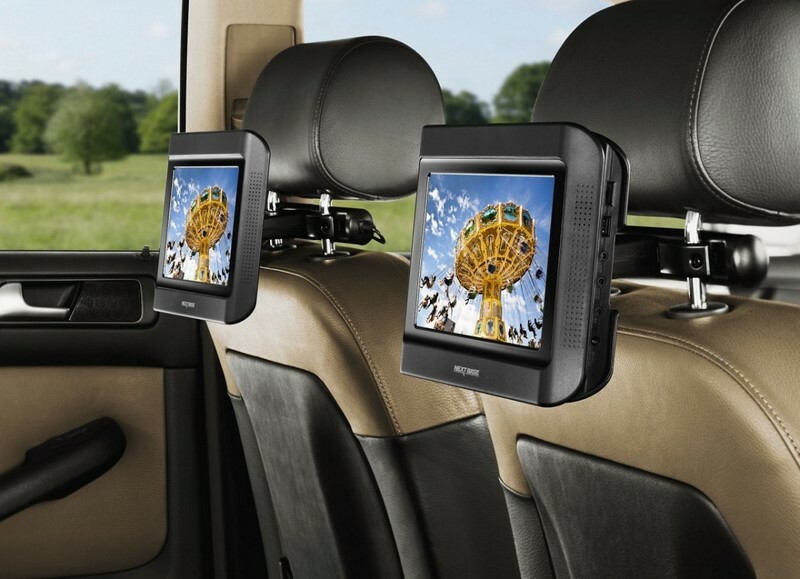 Perfect for long journeys, this will be the only in-car entertainment device you should ever need.